Here By the Bloods - Doug Grad Literary Agency, Inc. If Elmore Leonard had written a crime novel set in 1887, it would have been Here By the Bloods. Orphaned and raised by the local sheriff, 19-year-old half-breed Navajo Harlan Two Trees is tolerated by some, despised by others. But when the bank’s safe is blown and the sheriff gunned down, Harlan takes it upon himself to bring the killer to justice. The killer is known only as "The Snowman" for the flour he uses to stabilize his explosive of choice--nitroglycerin. And no one alive has ever seen his face. Harlan calls on his Navajo skills, using all five senses to track the robbers in New Mexico Territory’s Sangre de Christo (Blood of Christ) mountains. He captures The Snowman and brings him into town, no longer “the half-breed.” Harlan is a hero. Little does he realize but he is a pawn in a much larger game, one that leads to a double bank robbery in neighboring towns as the occasion of the captured killer’s hanging draws people from afar to witness the special event. It is a game fraught with danger, political corruption, hidden agendas and identities, and Harlan quickly goes from hero to despised fool. The climax: an explosive three-way showdown in a narrow mountain pass between the robbers, the Pinkertons, and the Navajo: nitroglycerin vs. Gatling gun vs. bows and arrows. Narrated by Harlan as he looks back on the events 30 years after the fact, Here By the Bloods contains elegant, stylish descriptions of the people, the scenery, and the deadly action. 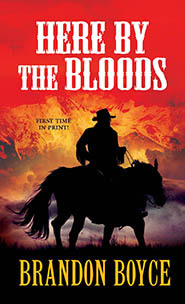 Somewhere between the westerns of Elmore Leonard and the literary West of Cormac McCarthy (with a little Quentin Tarantino thrown in for good measure), Here By the Bloods is a novel that will stick with readers for a long time. Brandon Boyce is a screenwriter who lives in Hollywood. Here By the Bloods is his first book, and the first Harlan Two Trees novel.